8.1 Save the date!…May 4…Come one, come all! 8.2 Thanks! Thanks! Thanks! Thanks! 21 Tree Removal/ Replacement and Solar Collectors on First Parish of Sudbury? 23 Support First Parish on Amazon.com. March has been some kind of busy month with lots of strategic thinking, some dancing, a successful annual pledge drive with many of you increasing your pledge (thank you! ), and the good news that Roberta Altamari will be remaining at First Parish in the role of Director of Youth and Young Adult Ministry! This is great news that Roberta is staying for 15 hours a week but let us also be mindful that her role will be evolving as she makes way for a new Director of Religious Exploration. So many exciting changes, yet reflecting on last August I have to be honest and share that my head is spinning. We have come so far in seven months and I am very impressed, amazed actually, that when I hit the ground running that you have kept up with the pace and in many ways have outpaced me! You are an amazing congregation of loving and compassionate people! I am not sure about you but when I think back about the highlights of this last seven months I am blown away, we have literally come miles since August. We are growing and evolving and with this we must also expect change, what you will read in this connector is that our Congregational Administrator, Donna Scalcione, has decided that the time has come for her to transition in her own life. In conversations with Donna she explained to me simply that, “it is time.” I support Donna’s decision to make this transition out of staff and back into the congregation and thank her for all of the important work that she has accomplished as the Congregational Administrator. As both Roberta and Donna transition please take the time to reach out to both and thank them for the important roles that they played during a time of significant upheaval in the life of First Parish! Not skipping a beat, the search teams have been chosen and we are imagining our evolving needs and the required qualifications of two new staff members, the Director of Religious Exploration – who will focus specifically on our younger children and a new Congregational Administrator. Where do we go from here? We continue to evolve, however, let me assure you that the pace is going to slow down a bit starting April 1st. Our goal for the remainder of the year will be to continue to flesh out our strategic thinking based on the meeting we had on March 8th. We will review our financial landscape with the help of your stewardship committee, the Finance Committee and the Board of Trustees so that we can imagine a sustainable future. With 80% of the pledges in, it seems that we will see a slight increase in pledges overall, and friends if you have not turned in your pledge card as of yet I would encourage you to do so. Your generosity, as we sort out income and our budget, will be greatly appreciated. Ultimately, over the next year we will continue to evolve and debate the inclusion of solar energy on our campus, upkeep of our facilities and how we can best share who we are and what First Parish has to offer the larger metro west community. As the buds break forth, we turn to tending the soil, and longer and warmer days arrive we will slow down a bit and shift our focus slightly. Yet nothing is static those buds have been preparing this entire time to burst forth, even without our attention, change and evolution is inevitable. Let us be truly hopeful! Let us be abundantly mindful! I offer this piece of Buddhist wisdom as we endeavor to finish out our church year strong, “permanence is an illusion” so you can either struggle against or embrace change. One thing is for certain if we desperately clutch onto a sense of permanence we will suffer. Instead, let us embrace the evolution of life as a spiritual practice of mindful witness and graceful fine-tuning. My initial reaction was mixed to Rev. Marjorie asking me if I wanted to stay at First Parish as the part-time Director of Youth and Young Adult Ministries. On one hand, I get to keep doing a few parts of my job that I really enjoy as I explore my next career path. On the other hand, I wasn’t sure that it is the best choice for First Parish. My biggest concern going forward is for the new DRE. We need to make sure that the transition is healthy and supportive for all involved. Most significantly, we will have to maintain very clear boundaries. The new Religious Educator needs space to bond with the entire congregation and lead you in both worship and education. Hearing that I’m staying in the role of Youth Leadership may lead to some of us not fully realizing that I will still be gone from my RE leadership roles at First Parish. I, myself, breathed a sigh of relief as I mistakenly thought I won’t have to say goodbye. Reality set in soon as I started to realize all that I’m still losing. I won’t regularly be seeing most of you. I won’t be here on Sunday mornings (except for Youth Sunday and Coming-of-Age Sunday). I won’t be sharing messages-for-all-ages, special “all-kids-together” events, and adult classes. The list is long of the events and programs that I will be handing over to the new Religious Educator. Even though this is a choice I made with great hope for my future, I will really miss all of this … and you. As we take the next several months to prepare for the transition of RE leadership, I hope we can celebrate all that we shared and look ahead to the exciting potential of the future of First Parish. I have begun processing with the youth that they take the lead in welcoming the new era in RE at First Parish. One of the greatest strengths in having separate RE and youth leaders is that you can find people who have the particular gifts the congregation needs. We need to grow our RE program and we need a leader who is energized, innovative, and passionate about working with young children. A great opportunity is here and I look forward to welcoming our new leader with open arms and genuine promises of my support … I hope you will join me! “To everything there is a season…”and soon it will be time for me to end one “season” at First Parish and begin another. At the end of June I will leave my position as your Congregational Administrator. For six years you have honored and trusted me with the dual role of staff and member. As I told Rev. Marjorie in February, I know in my heart that it is time for me to move on from my staff role and go back to being “just a member”…time to leave the First Parish Office in other hands. Yes, this is a change but it is not goodbye. Everyone is welcome – newcomers and long-timers – and bring your friends and neighbors for a night of fun and fund-raising, as we transform the parish hall into a tropical escape filled with “fierce” bidding, food and drink, music and excellent conversation. Brink your children as well, and they can enjoy themselves at the kids party in the Commons while you indulge in a bit of adult time. The evening starts off with a silent auction where you bid on paper for a chance to buy at bargain prices – items such as restaurant gift certificates, handmade items, and an ipad! Then we progress to the verbal auction, featuring auctioneers extraordinaire: Steve Ziobrowski and Rob Kinslow, where you bid out loud for bigger-ticket items such as dinner parties, vacations, and a sermon by Rev. Matty. Dinner parties – entertain a group of old or new friends and raise money for First Parish! It is always a fun night, and we hope to see you all there! What if you could hear a musical ensemble that has been performing together for years present its best works? Sunday, April 6, the First Parish of Sudbury choir and music director Debra Morris-Bennett will do just that when they celebrate 25 years of singing together. Morris-Bennett has assembled a “greatest hits” compilation culled from First Parish’s twice-yearly Music Sundays since 1989—a compilation representing nearly 50 performances that have often included some of the region’s finest professional musicians. The music will be presented during First Parish’s regular Sunday service, which begins at 10 a.m. All are welcome and first-time visitors are encouraged to attend. Some of the choral pieces to be included are “The Road Not Taken” by Randall Thompson, with text by Robert Frost; “The Lord is My Shepherd” from John Rutter’s Requiem; movements from Missa Gaia by Paul Winter and Jim Scott; pieces from The Holocaust Cantata by Donald McCullough; The World Beloved: A Bluegrass Mass by Carol Barnett; and the First Parish choir’s all-time favorite piece, “Sure On This Shining Night,” a stirring setting of a poem by Pulitzer Prize-winner James Agee by composer Morten Lauridsen. The choir will be joined by Noriko Yasuda on piano, Tim Feil on oboe and Emily Taubl on cello. They will also be performing music of J.S. Bach (Cello Suite No. 1) and Gustave Vogt (Solo de concert No.6 for Oboe). It is rare to hear such a selection of choral and chamber music in the space of an hour. We hope you can join us. Save the date!…May 4…Come one, come all! For 10 years, First Parish of Sudbury has sponsored a team to participate in the Walk for Hunger. This is the 45th annual fundraiser by Project Bread. Funds raised through the Walk support more than 400 emergency food programs in 135 communities in Massachusetts, including the Sudbury Food Pantry. This year, First Parish is making an all out effort to participate in the Walk for Hunger. Rev. Marjorie is going to lead the walking team sharing some worshipful moments along the way. A simplified worship experience in our Sudbury Meetinghouse will also focus on the same themes. We hope many (most!) of our First Parish adults and children will join us by participating in the walk. Rev Marjorie is putting such a strong focus on the Walk for Hunger this year because hunger and the food insecurity associated with poverty continues to be a major health issue and a social justice concern in Massachusetts. For most of us, hunger is a fleeting need we can satisfy quickly. But hunger isn’t fleeting for 11.4% of Massachusetts’s households—the 700,000 children and adults who don’t know where their next meal will come from. Join the volunteer team—for those who can’t walk, you can still support this effort, join the fun, cheer on our FPS walkers and raise money! We are helping at Rest Stop 4 at the Elliot Church in Newton Corner (just off the Mass Pike). This is basically a “sit down” job that involves providing water to the walkers and stamping their walk cards. We are looking for 10 people to be there between 8:30 AM and 1:30 PM. We will organize transportation from Sudbury. Go to: http://support.projectbread.org/goto/FPSVolunteers to join the volunteer team and set up your donation page. Donate to one of the teams—for those who are unavailable to either walk or volunteer, we still need your help. Go to: http://support.projectbread.org/site/TR?fr_id=1230&pg=pfind to make a donation to one of the FPS teams. In the search box, type in “First Parish of Sudbury”, then choose a team for your donation: Walk Team or Volunteer Team. If you would prefer to donate by cash or check, please make the checks out to Project Bread and give them to any team member at the Walk table during Social Hour. If you have any questions, please ask Liz Rust, Sherri Cline, or Ginny Doxsey. The Walk For Hunger is THE PLACE TO BE on May 4! THE MORE, THE MERRIER! Over the month of March, we collected 100 pounds of pet food, 100 toothbrushes, dozens of paper products, and bags of assorted other items for the Sudbury Food Pantry. Your donations, large and small, made this collection a great success! [break-wrap]? > if you want to participate. At the Statehouse: April 8 to speak to our legislators about pro-immigrant legislation. A non-profit community-based organization established in 1998, the Sudbury-Wayland-Lincoln Domestic Violence Roundtable is dedicated to promoting safe and healthy relationships. The Roundtable sponsors public programs every year to educate the public about domestic violence in all of its forms. One in three women will be involved in abuse in their lifetimes. Children are often victims and even if not physically injured, there is psychological damage from being a bystander. Men are also victims. It is felt that all abuse is under-reported. The Roundtable seeks to form community partnerships with interested citizens, community organizations, the clergy, educators, health care providers, legislators, and direct care service providers. Every December, Roundtable members, with community support, fill all of the wishes of a family in shelter. On Valentine’s Day Sudbury Extended Day students decorate Valentine’s bags to be filled with small gifts for everyone in shelter at REACH in Waltham, The Second Step in Newton, and Voices Against Violence in Framingham. In May the Roundtable holds a “Shower for Shelters” to collect new kitchen and bath items for those leaving shelter to set up new and safe homes. Members place hotline cards in 150 locations in the Metrowest area to provide safety tips and resources. The Roundtable has worked hard to help educate teens about healthy dating relationships and to prevent bullying in all of its forms. In January we held a program about safety for seniors with Police Chief Scott Nix as one of our speakers. In March we helped to sponsor an all-day forum called “Courage to Care” for 200 students at L-S, including students from several other high schools. Please visit our website at www.domesticviolenceroundtable.org to find out more about our programs and resources. We invite you all to attend our meetings held on the second Tuesday of each month at 3 PM at the Wayland Public Safety Building. Thanks so much for your continued support of the Roundtable’s endeavors through the years. Details about this organization can be found in the article at the beginning of this section. On February 24 Uganda’s Anti-Homosexuality Bill was signed into law, prescribing life imprisonment for homosexuality and lengthy jail terms for “aiding or abetting homosexuality.” A group including Ugandan human rights organizations, LGBT activists, attorneys, and lawmakers filed a constitutional challenge to the law. Dr. Frank Mugisha, Director of the organization Sexual Minorities Uganda, visited Washington, DC, to share priorities for action to counter the law. Among the solidarity actions Mugisha offered as being most needed was his plea for church leaders to speak out aggressively in opposition to the law. Please bring your donations to the Women’s Alliance RUMMAGE SALE this week, Wednesday-Friday, April 2, 3,and 4 and plan to shop the RUMMAGE SALE APRIL 5 from 10-2. Clothes and shoes for everyone, CDs, DVDs, toys, games, books (no magazines or text books), household goods of all kinds, office and craft supplies, linens, electronics, more! All donations should be clean and in working order, please. (Pretend it will have your name on it). Many thanks from the Women’s Alliance [break-wrap]? Please continue to bring to the office for recycling your used ink and toner cartridges (any brand, any type). We get $2 in store credit for every one recycled at Staples. The Men of First Parish will meet at Rev. Matty’s house in Stow on Sunday, April 13 for a walk and pot luck bar-b-q. Come around 3pm or later. Tom Arnold will send out a signup menu list so we don’t all bring beer. [break-wrap]? You may send your registration to the address on the form or leave it in the Alliance folder in the workroom. Scholarships are available in complete confidence from Alliance Treasurer Carolyn L. After April 18 all questions should be directed to Sherene Aram. The sun rises on Easter morning to signify the end of the darkest night, the metaphorical time of trial, and the reawakening of hope. We look for the sun on the horizon, however, the real light that we kindle burns within. This Easter morning ritual will be held outside in the upper memorial garden dress warm, bring a blanket some coffee or tea, and a favorite poem or piece of music to share. We will gather at 5:30 on Easter morning. – Rev. Marjorie [break-wrap]? Saturday, April 26 from 9 to 2, pizza lunch included. (Rain date: Sunday, April 27 noon to 4pm.) 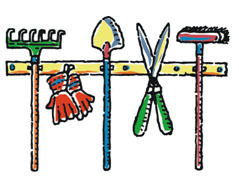 Your Landscape Committee needs your help cleaning up our property for the year ahead: raking, cleaning up sticks and trash, pruning, turning the compost, etc. Join us and we’ll make it fun and enjoy pizza together for lunch, too! Bring the kids and some yard tools. Come for an hour or two and contribute your time and effort to make our outdoor spaces shine. The Religious Exploration Salon is a group that meets 3rd Sundays to discuss various topics. In March we continued the experiment with Bohm Dialogue on the topic “altruism and selfishness in human nature“. Everyone is welcome. You are welcome to think about the topic (to be announced in the 4/25 ENEWS) beforehand but no preparation is required or expected — come as you are with whatever thoughts/feelings/intuitions you have, ready to listen, learn and contribute. Our next meeting will be on April 27th at 7pm in the Brackett Room. It’s Spring, and time to consider whether you would like to donate a memorial tree, shrub or patch of wild flowers to our Memorial Garden. If it is something you would like to do to remember a deceased loved one, please call or email Marge Langmuir, Landscape Committee. First we want to thank everyone who has given treasure, time and talent to First Parish of Sudbury in support of our annual budget. Together we strengthen our First Parish community. 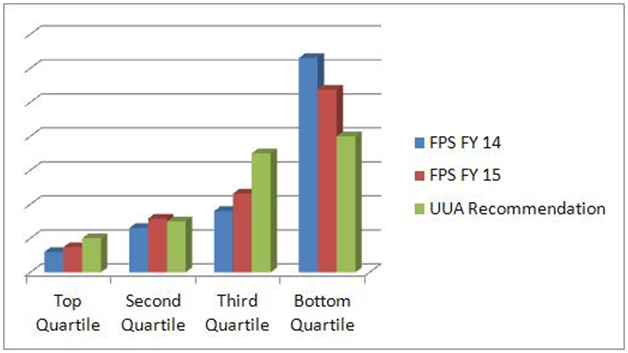 • 57% increased an average of 17%; the range of increases was from 2% to 140%. • 21% decreased an average of 32%. • 22% of pledges remained the same. • We had eight new pledges this year. • 20% of pledges increased one or more levels, as we suggested in your letter. These are not the final numbers, since we still need to hear from 20% of our members and friends, but we see a commitment to First Parish from our fellow congregants and a modest increase in the total amount pledged. Now our Finance Committee begins planning our budget for next year. As a congregation, we will vote on this budget at our annual meeting on June 1. I urge everyone to pay attention. This is your money we are spending. And what might we do with our money? There’s the big picture and the little picture. Three weeks ago on a Saturday we had a visioning exercise, which was wonderful and exciting, brilliant and inspiring. I was there and I think I speak for us all when I say I came away energized and eager to move forward. A lot of exciting ideas came out, from broad themes to specific suggestions for projects and outreach. Now Marjorie and our Board of Trustees are working on shaping those ideas into concrete goals so we can be stronger and more supportive internally, and we can have more impact on changing our world for the better. You’ve already heard some of our needs from the pledge materials: We want to close our small budget gap, and fund some infrastructure needs within our organization, such as our website. And as I said our FinCom has already started that planning. The formal Pledge Drive is over, although there’s always time to pledge if you haven’t yet or to give a one-time gift if that’s possible. The Stewardship Team will stop asking for your money, but First Parish still needs your time and talent. For example, over two dozen people helped with the Pledge Drive this year. Your help is always welcome – in small one-shot ways, like coffee hour (which I personally recommend as a way to meet everyone – stand behind that counter and you get to say hi and be thanked! ), or in larger ways, like serving on a committee or volunteering in our RE program, or connecting with our teens. If you have small children and want to see what might be coming – help out in Our Whole Lives (OWL) or Coming of Age. It’s good for them; good for you; and its good for us. We ARE self-supporting in all ways. And finally I want to put in a personal plug for the rewarding part of volunteering –it’s awesome to feel like you’re a part of a larger effort. Together we are more than the sum of our parts. Through my involvement in this community I’ve formed new friendships, I’ve found new interests, I’ve stretched myself beyond my comfort zone. Most of all, my involvement here encourages me, supports me, and challenges me to become the person I want to be. Just one word – Thanks.
) if you would like early adopter access to the internal website. The members of the Town Center Task Force are Deborah Kruskal, Jan Hardenbergh, Marge Langmuir, Bruce Langmuir, Bridget Hanson, and Sherri Cline. Music, music, music and great food to boot! Mark your calendar for the May 10, 2014 show. Tree Removal/ Replacement and Solar Collectors on First Parish of Sudbury? Dramatic tree removal work was originally scheduled for February 8, 2014, but due to weather and too much snow on the ground it was postponed three times and finally done on Saturday March 15th. In only about four hours, five pine trees and three maple trees were cut down and chipped, and the brush removed for truck access to the playground area. The center of one of the pine trees was rotten. Those of us on these committees and SED think the area looks better and looks more in keeping historically. 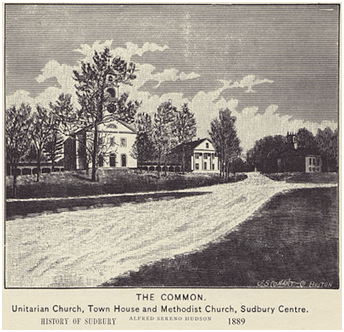 In looking at the Sudbury Town Center in an 1889 drawing that is shown above, and photographs taken in 1889 and 1929, show fewer trees and no pine trees in the town center. The playground area is now more functional. The wood chips will be spread in the Memorial Garden as they are not suitable for the playground. As reviewed in the March 5, 2014 issue of the Connector, these five very tall white pine trees and 3 additional maples in the area around the playground had been determined to be either too close to the buildings, poorly placed, prone to disease, or a serious risk to people and buildings during storms with high winds. A plan has been developed to replace these trees with more appropriately placed plantings, and ones that will allow any future plan for solar panels on the Atkinson Wing roof to be fully effective. We want to reassure everyone that the amazing Beech tree and Alliance Dogwood have remained. – More on this was published in the Connector, March 5th edition. We have just received a solar PV system installation proposal from SunBug Solar who propose utilizing high efficiency black collector panels, over 18%, from SunPower Solar. (Typically run around 15% efficient.) The system size is 16kW, estimated to generate around 45% of our annual consumption, has a 25 year warranty, and is expected to last more than 30 years. We have been offered a Power Purchase Agreement for installation of the system, which would have no cost to First Parish of Sudbury for the solar system. They also have offered the option of us purchasing the solar system, which First Parish in Concord did, for which they had a fundraiser. The SunBug proposal needs to be studied. In the past we had another proposal from another firm which we did not feel was acceptable as the system was too small and did not produce enough electrical power. FYI on “The Common” of Sudbury center drawing above, The Town House, to the right of the church, was the Sudbury Town Hall and across Concord Road the Methodist Church is now the Presbyterian Church. Population of the farming community of Sudbury in 1929 was about 1200 persons. Make this into a bookmark or favorite in your web browser so you will always have the link on hand. There is also a link at the end of this newsletter, or visit fpsudbury.org and use the link on our homepage. If you need help, Marc K will be happy to assist you. By phone—check the recorded message at the First Parish number, 978-443-2043. On First Parish website—Go to www.fpsudbury.org. The front page will have an update. On CBS Boston website—Go to www.CBSBoston.com, click on “Weather” then “School Closings” for cancellation of Sunday worship service only. By television—Tune in to WBZ-TV and watch the crawl at the bottom of the screen for cancellation of Sunday worship service only. Don’t miss Open Table’s 25th Anniversary Iron Chef Competition & Fundraiser. Saturday, April 12, 2014 — 6:00 – 9:00 pm at 300 Baker Avenue, Concord MA. Watch local teams compete as they slice and dice their way to cooking fame. Cheer on your favorites when they present their creations to the judges! Enjoy hearty hors d’oeuvres, delectable desserts, and a cash bar. Tickets available online at www.opentable.org and at: Debra’s Natural Gourmet, West Concord; Serendipity Café, Maynard; The Cheese Shop, Concord.